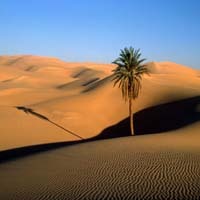 Sahara desert is the second largest desert in the world. Also it is the world’s largest hot desert. It is located in the northern portion of Africa and spreaded over the following countries Algeria, Chad, Egypt, Eritrea, Libya, Mali, Mauritania, Morocco, Niger, Sudan and Tunisia. Almost 10% of the African continent was made-up with this desert. Sahara has several mountain ranges and most of them were volcanic. Emi Koussi is the highest peak found in Sahara Mountains (11,204 ft). Although lot of rivers present, the only permanent river in the desert is the Nile. It flows from Central Africa to the Mediterranean Sea. Due to the high temperature of the Desert, the plant life in the Sahara Desert is very less. The most commonly domesticated animals found in the Sahara are Dromedary camels and goats. Remaining populations of large mammals have been greatly reduced by hunting for food and recreation. The central Sahara includes five hundred species of plants.